September, week 2 preview: Ike, Fannie and Freddie get laid. 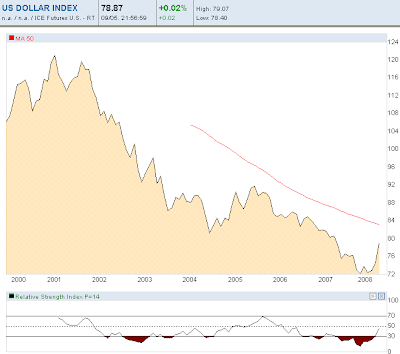 What does a $25 - $35 billion (depends who you read) mortgage market bailout feel like if you are the US dollar? Pinprick probably, but the start, maybe, also of many pinpricks. It's a $5.3 trillion dollar problem. For that matter, what does a unpleasantly sized hurricane turning the opposite direction from the expected (south west!) have the potential to do in the Gulf of Mexico to oil prices - in hand with a Paulson bung? For traders, the getting laid this week likely refers to the laying of commodity bets.